Meeting running long? Or an unexpected opportunity to work at home, close to the fire station? With FireServiceRota you have insight into when you are needed, and when you have the freedom to take some time off. You can change your duty schedule at any time with any device. As extra assurance, FireServiceRota requests the on-call crew to confirm that they are on their way to the fire station. Our 13 years of experience have taught us: an online scheduling system has to be flexible and easy to use. FireServiceRota seamlessly supports fire brigades with its unique combination of strict planning (standby duty), team rosters, personal rosters, and the ability to cope with last-minute changes. 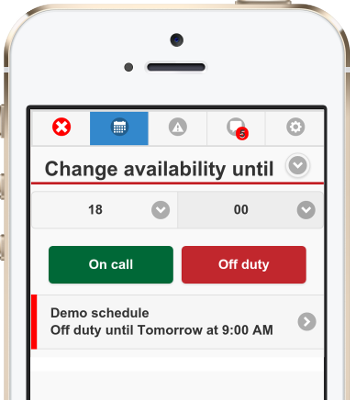 FireServiceRota is accessible via every device: computer, tablet, smartphone ( ) and pager.